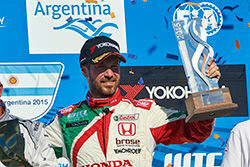 Honda Civic driver Tiago Monteiro stood proudly on the third step of the podium after a well-earned third place finish in Race 2 of the FIA World Touring Car Championship event at Termas de Rio Hondo, Argentina. His third place triumph in Race 2 was one place better than his race finish in the first race of the day and both results give him an early third position in the Driver’s Championship. 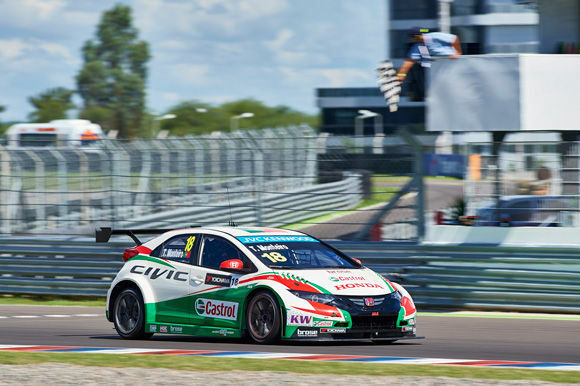 Equally consistent and competitive was Castrol Honda team-mate Gabriele Tarquini with 5th and 4th place finishes to highlight the improved performance of the Civic WTCC cars. 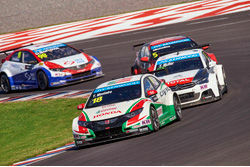 In Race 1 the fast starting Honda Civics of Tiago Monteiro and Gabriele Tarquini dived into the first corner to grab 4th and 5th places at the start of 13 hot, fast laps, positions they held to the checkered flag. 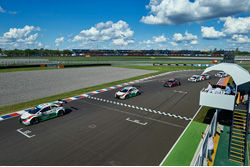 The impressive drive from Norbert Michelisz underlined his talent once again. Having missed official qualifying yesterday due to his technical problem, the young Hungarian made a storming start and raced past many experienced drivers take 6th place at the checkered flag.